One of the most helpful things you can do for your arthritis is to be physically active. Regular physical activity, when combined with an accurate diagnosis and an appropriate medical treatment regimen, can help relieve stiffness and maintain or improve your joint mobility, muscle strength and overall stamina. Range of motion (ROM) for flexibility and strength. These exercises can be done sitting or standing. Be sure to maintain correct posture whichever starting position you chose. ROM exercises should be done slowly. Try to achieve full joint ROM with a gentle stretch at the end ranges followed by hold times of three to six seconds. Do four to ten repetitions of each exercise. Strength exercises are designed to help improve overall function in daily life. If a beginner, try four to ten repetitions and work up to eight to ten repetitions. Try to do two to three sets of each exercise. Examples: Wall push-ups, abdominal tightener, chair push-up and bridging. As a certified Arthritis Foundation Exercise Instructor, I help my clients follow the “Two-Hour Pain Rule”. Some soreness is a normal response to exercise; if you develop joint pain that lasts for two hours or more after exercising and then cut back. Move your joints until you feel a gentle stretch. Don’t move past the point where you experience more pain than you usually have. Give your muscles time to relax between each repetition. Avoid quick, jerky movements. Do not hold your breath during exercise. By breathing correctly you will reduce muscle fatigue. Do purposeful breathing. Count out loud, it will help you breathe deeply enough. Start slowly with just a few repetitions of each exercise and gradually increase your repetitions. Keep in mind that if you have been inactive for a long time, it will take you longer to get going again. Be patient with yourself. Exercise when you have the least amount of pain. Do not exercise on a full stomach. Move your joints through their range of motion each day. Don’t take pain medications before exercising because this could lead to overexertion and joint damage. Periodically check your joints for changes in how they are moving. Pay extra attention to those areas where you are most stiff or have pain. Avoid unnecessary movement. For example, when exercising your neck by tilting your head to the side, avoid moving your shoulder or leaning with your torso. Notice any tension areas. If you are grimacing or clenching your teeth or tensing neighboring body parts…stop. Notice your energy level – slow down or stop exercising before you get too tired or start to feel light-headed and dizzy. Stay hydrated. Your posture is key, look at your reflection in a mirror; you will be surprised how differently you will move. • Balance – be careful to maintain your balance while doing your standing exercise. • Joint surgery – if you recently had joint surgery on a joint used for a particular exercise, check with your physician or physical therapist before beginning an exercise program. Lori Michiel is a certified Arthritis Foundation Instructor and develops each of her trainers working with arthritis and osteoarthritis using these methods. The National Academy of Sports Medicine (NASM) invited Lori to author an article on exercise benefits, challenges and modifications for those suffering from arthritis and osteoarthritis. For Lori’s demonstrations of recommended exercises, please see Exercise Snack Videos and subscribe to the Lori Michiel Fitness YouTube Channel. 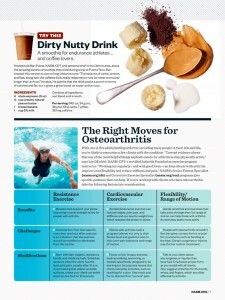 Disclaimer: It should be noted that this information by no means addresses all of the potential arthritic imbalances. Seeking the “one size fits all” approach is not always the answer. These solutions should, however, give you a good starting point to help improve your range of motion, and promote pain reduction. Do not neglect your medical routine and check with your health care professional before starting any exercise program.